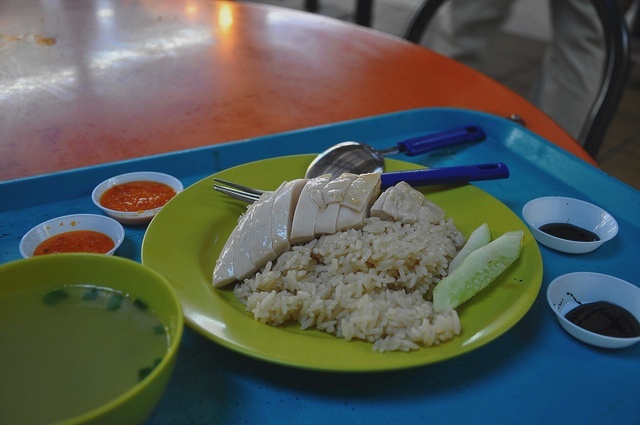 Hainanese chicken rice is a dish of Chinese origin mostly associated with Singaporean cuisine, and lesser so for Malaysian cuisine or Thai Cuisine, although it is also commonly sold in neighbouring Thailand, and found in Hainan, China itself. So-called due to its roots in Hainan cuisine and its adoption by the Hainanese overseas Chinese population in the Nanyang area (present-day Singapore), the version found in Singapore region combines elements of Hainanese and Cantonese cuisines along with culinary preferences in the Southeast Asian region. Clean the chicken with a small handful of kosher salt, rub the chicken all over, getting rid of any loose skin and dirt. Wash and pat very dry inside and outside. Season generously with salt inside and outside. Stuff the chicken with the ginger slices and the green onion. Place the chicken in a large stockpot and fill with cold water to cover by 1 inch. Bring the pot to a boil over high heat, then immediately turn the heat to low to keep a simmer. Cook for about 30 minutes more (less if you’re using a smaller chicken). Check for doneness by sticking a chopstick into the flesh under the leg and see if the juices run clear or insert a thermometer into the thickest part of the thigh not touching bone. It should read 170F. When the chicken is cooked through, turn off the heat and remove the pot from the burner. Immediately transfer the chicken into a bath of ice water to cool. Don’t forget to reserve the poaching broth for your rice, your sauce, and the accompanying soup. The quick cooling will stop the cooking process, keeping the meat soft and tender, and giving the skin a lovely firm texture. To cook the rice: Drain the rice. In a wok or sauce pan (use a medium sauce pan if you plan on cooking the rice on the stove top), heat 2 tablespoons of cooking oil over medium-high heat. When hot, add the ginger and the garlic and fry until your kitchen smells like heaven. Be careful not to burn the aromatics! Add in your drained rice and stir to coat, cook for 2 minutes. Add the sesame oil, mix well. To make the soup: You should have six or seven cups of the reserved poaching broth left over to serve as soup. Just before serving, heat up the soup, taste and season with salt as necessary. Serve the chicken rice with chili sauce, dark soy sauce, cucumber slices, and a bowl of hot broth garnished with cilantro or scallions. This looks easy… it’s perfect when the day is busy and you need a quick and delicious meal..
A beautiful traditional recipe. Yummy!! !Thank you!